Look, just because the restaurant is named "McDonald's," that doesn't make it authentic Scottish cuisine. Jock Slop Burger is a nasty piece of meat from the land of the Scots! He'll take on anyone with his saggy bagpipe highland flinger! Jock proudly wears the McGrossery tartan when he goes into battle. This guy is stacked full of stink and ready to show his brave heart as he battles the Rotbots! Hamburgers are every bit as Scottish as kilts, bagpipes, whisky and haggis - in that none of those things are actually from Scotland. Hamburgers you already know about, but kilts were Irish, bagpipes are Turkish, whisky came from Italy (and probably China before that), and haggis was eaten in ancient Greece. So at that point, a chopped steak from Germany makes just as much sense as anything else here does. Oh, and while we're at it? Even the Scots people weren't from Scotland: they were an Irish tribe who moved into Caledonia during the fifth or sixth century AD. And you thought America got by on adopted culture! 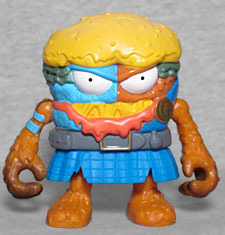 The third series of Grossery Gang figures is available in two styles: Target is carrying the regular figures (in some of their stores, at least), while discount fun-times store Five Below has versions on smaller cards with fewer accessories. 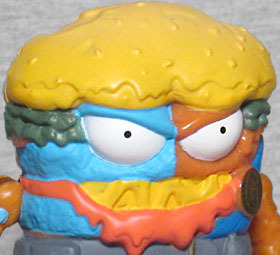 So if you're willing to pay two dollars more, you can get things like this squishy rubber Grossery, which depicts Jock in his un-powered form. So if a murderer ever burst into the room and told you you needed to produce an inch-high rubber hamburger wearing a kilt or he was going to kill you to death, well, this toy might just save your life! If not for that tiny figurine, Jock Slop Burger's intended foodstuff would be slightly unclear. [What, his name wasn't enough of a clue for you? --ed.] Yes, they may call him "Burger," but he looks more like a sloppy joe, with loose, formless meat instead of shaped patties. And that would fit with his name equally well! 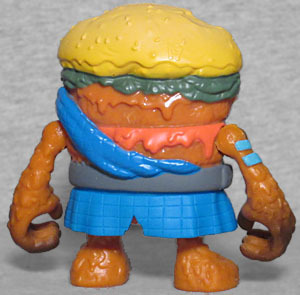 It's easier to recognize the essential burger-ness of the smal PVC one, in part because it doesn't have half its face painted blue the way the big one does. It also makes it clear that the red lower lip is supposed to be grease or ketchup or something, and that the yellow in his mouth is cheese. Jocko is another one of those characters who does not have a removable head, with his arms growing out of what would normally be his jawbone. Fitting his Braveheart-inspired origins, he's wearing a raggedy kilt that wraps around his waist and goes up over one shoulder, and just like in real life, he's got nothing on underneath it. It's got sculpted-in lines to suggest plaid. For the record, the idea that certain patterns represent certain clans is 19th century bunk: the word "tartan" comes from the French tiretaine and referred to the fabric, not its design; it comes from the Latin tyrius, the name for the kind of cloth Romans associated with the city of Tyre; in medieval Scotland, the word "tartan" just meant woven fabric, rather than knitted (and "plaid" comes from the Gaelic word for a blanket); the colored patterns were known as "setts," and were based on the skills of a the weaver and what dyes were locally available. So anyone who gets snooty about their official clan tartan is trading on an idea that's approximately the same age as the bicycle. Most of the figure's meaty body is an orangey tan, though it gets darker (and starts looking more like cooked meat) at the fingertips. There's dark green lettuce peeking out from beneath his seed-speckled bun, but the blue paint on his face doesn't do much to help sell the idea that this is a burger. Is that woad, or mold, or what? That blue ketchup they sold for a little while? Also, since he's going commando under the kilt, that means the burger only has a top bun, not one on the bottom, and is thus technically not a sandwich at all. 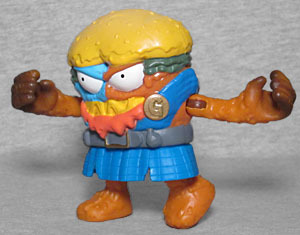 Like other non-neck-having Grossery Gangsters, Jock Slop Burger has swivel/hinge joints for his shoulders and hips. For some reason, the interior rings of those joints are the dark brown seen on the hands, despite the fact that that color doesn't appear anywhere else on the figure. The kilt is molded from flexible PVC, so it doesn't block the legs. 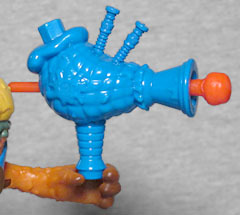 If you splurge on the Target version of Sloppy Jimbo, you'll get a "flick & launch grot blaster," designed to look like a set of bagpipes. That's a really clever idea, and led to me wanting to get the full version instead of saving two bucks. It's a very "1990s Playmates TMNT line" kind of accessory. But in a just great example of insight and awareness, the figure can't actually hold it: the handle is too wide to fit in either of his hands, and the plastic they're made of is too inflexible to pry them open without damaging them. Top notch design work. At least if there weren't a ridge at the base of the handle, you could slide it into his fist, but nope, not an option here! This figure is kind of a weird combo - there's nothing about a hamburger that says "Scottish," but to be fair, there's also no reason knights would have doughnuts or ninjas would have chewing gum, either. We just wish he could actually use his weapon.